With picturesque views across the river Thames, The Vault is a popular place to enjoy a meal or drinks with friends. The menu has a wide range of international dishes which suit all palates. Do you work at The Vault? What did you think of The Vault? Great place, good food, good drinks. Fun atmosphere and good staff. This bar has a bit of character and it's a pleasant place to be in. Also, the cocktails are really tasty. Came across this bar while walking along the Thames. Great little find - food was nice and well priced, staff were very accommodating and the view under Tower Bridge was certainly an unusual sight while chomping on lunch. I would definitely recommend - a hidden gem! Great for lunch! I went there for a quick bite to eat as I work near by. I had the fish and chips and they were super! Also the view of the river really made my lunch that extra bit nicer! I went to The Vault with my friends on Friday night to have a quick drink and we ended up staying until last orders. The staff are a good bunch and are always up for a good laugh! The food is good value and the cocktails hit the spot! I'm coming back there next Friday! This tiny place occupies one of the most unusual and impressive sites of any bar in London, but sadly the rest of the offer doesn’t live up to the location and the view. The Vault is embedded into the main southern pillar of internationally recognised landmark Tower Bridge. It’s an unexpected location for a bar, so most people walk past it without realising it’s there, but it’s perfectly placed for the Tower Bridge exhibition and other nearby attractions like HMS Belfast and the Tower of London. The most desirable spots are the tables at the far end, giving a unique view of the underside of the bridge’s deck which must be especially breathtaking on the now rare occasions when it lifts up. Otherwise, the Vault is a utilitarian space with white tiled walls, simply furnished, rather cramped and, if you’re close to the door on a cold day, rather draughty. Until late 2011 it was a faintly Russian-themed bar named Most, but has relaunched with a more general offer. 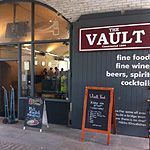 There isn't much of a buzz at the Vault, though the place does tend to get relatively crowded with a mix of after work drinkers and passers-by – the overloud music, worryingly sticky drinking shelves and inattentive staff don't help. The Vault's food offer is straightforward, starting with cooked breakfasts from mid-morning. Lunch and dinner options include pizzas from around £6, fish and chips (£8.50), burgers (£7.95), vegetarian risotto (£7.50) and tapas platters. Keg and bottled beers are served, mainly standard stuff but brightened in the former case by Staropramen and Hoegaarden, in the latter by Brooklyn Lager, Fuller’s London Pride and Shepherd Neame Spitfire. 18 wines are mainly available by the glass (from £4.50) and a list of 10 champagne cocktails (£10.25) provides a minor specialism. Other cocktails are £7.50. You get the impression the Vault trades on its unusual location without making much of an effort otherwise. Unfortunately the space itself is a challenge: with its echoing arched roof, white tiles and claustrophobic dimensions it has all the native ambience of a tube station corridor, and needs something special to redeem it other than the admittedly spectacular view.